← Merdeka 2014: Stand up the Negaraku in cinemas nation-wide, 28 August-16 September! Petronas and the ‘missing’ umbrellas! Followed by Gan Pei Nei, Msia PM Press Office and YY. Daftar sekarang untuk menebus Payung Edisi Terhad. Sila layari http://www.mymesra.com.my/daftar untuk maklumat lanjut. 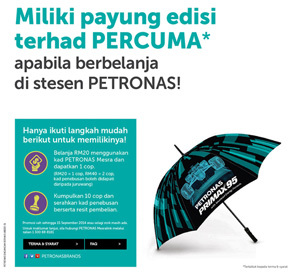 Due to overwhelming response, the redemption period for the “Own Free Limited Edition Umbrellas When You Spend At PETRONAS Stations” promotion has been EXTENDED! If you have collected 10 stamps by 15 September 2014, please register at your preferred PETRONAS station for umbrella redemption. Registrations are open from 1 – 15 October 2014. You will be contacted once your umbrella is ready for collection. Ensure you have collected 10 stamps before 15 September 2014. 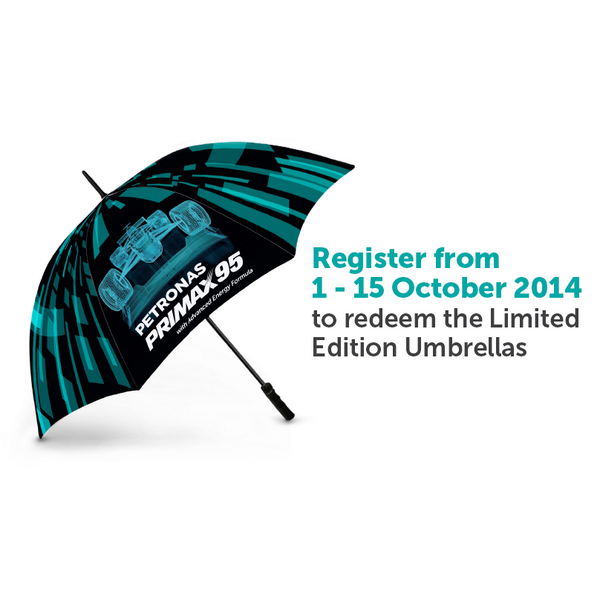 Register between 1 – 15 October 2014 at your preferred PETRONAS station for umbrella redemption. Fill up the registration form with your contact details and ensure the PETRONAS station stamps your redemption card. Wait for our call to collect your umbrella. Collect your umbrella from your preferred PETRONAS station within 14 days from our call. You will only be eligible for the umbrella redemption if you have collected all 10 stamps by 15 September 2014 AND have registered at a preferred PETRONAS station between 1 – 15 October 2014. The promotion, which runs from July 20 to Sept 15, requires customers to collect 10 fuel purchase receipts in order to redeem a special umbrella. And so i got my petronas umbrella,hahah,how bout u? PETRONAS IS RIGHT BUT STILL WRONG! Petronas can remain stubborn, insisting that it is a limited edition umbrella, that it is offered in a first come first served basis, and that it ran out of stocks due to the overwhelming response. Petronas would be right on all counts. However, what may have sounded like a good public relations masterpiece is turning into a national disaster. People are saying things like: staff took all the umbrellas, there were no umbrellas to begin with, too few were produced, petrol stations gave it to their few favourite customers, and so on. Are these things true? Does it matter? People believe in these rumours, unsubstantiated though they are, and that is what counts. dari sabah sampai la ke perlis..harammm.. 1 payung pun x dapat..bukan giler payung sangat..tapi sekurang2nya nak la jugak dihargai..dapat cekelat heck pun jadilah daripada xde langsung..
@Petronasbrands ur umbrella very difficult to get. If not so much stock. Don say as a gift. I went so much petronas station. Heard about Petronas‘ umbrella giveaway complaints via social media. Do you have such experiences with the stations telling you ‘no stock’? I witnessed a man shouting at a few Petronas staff because the infamous umbrella that’s always out of stock. 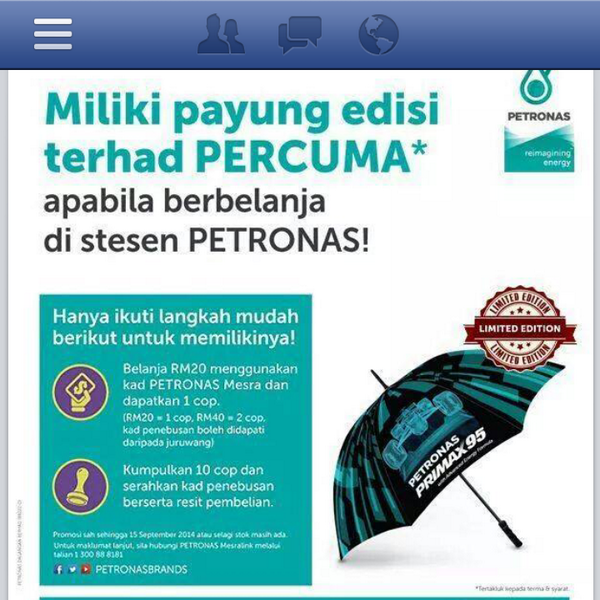 @Petronasbrands please re stock the petronas umbrella!!! your promotion is still on going!!!! Date end of collection is 30th September 2014! Dear Valued Customer. 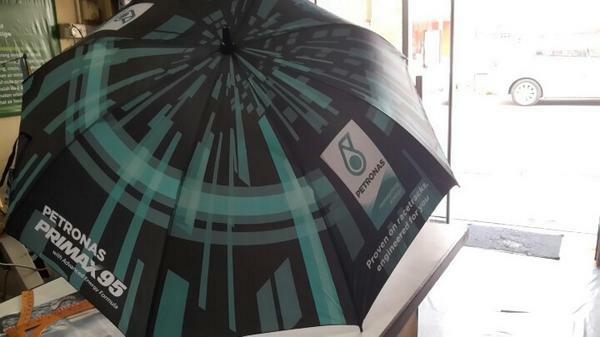 The Petronas limited edition umbrella is available for collection. Kindly be informed we can only give 1 umbrella. Please collect the umbrella within 2 days if not we will release the umbrella to our next customer. Thank you for your patience. – Petronas xxxx (lokasi dirahsiakan). One upset customer found a creative outlet for his frustration by producing a parody video of his experience of being told that the umbrellas are out of stock at no less than five Petronas stations. The two-minute video was spliced with footage of 1980’s heartthrob Faizal Hussein riding a motorcycle with a rucksack and sleeping bag on his bag from cult movie ‘Gila-gila Remaja’. Renamed ‘Gila-gila Payung’ (Crazy over umbrellas), the video has received more than 6,000 views on YouTube. Checks found that Petronas’ Facebook page was also flooded with comments on the missing umbrellas. The customers are also crying foul over the ‘first-come first-served’ clause which they claim was not stated when the promotion started in July. One customer, Fadzullah S Medar, said he believes the umbrellas never existed. 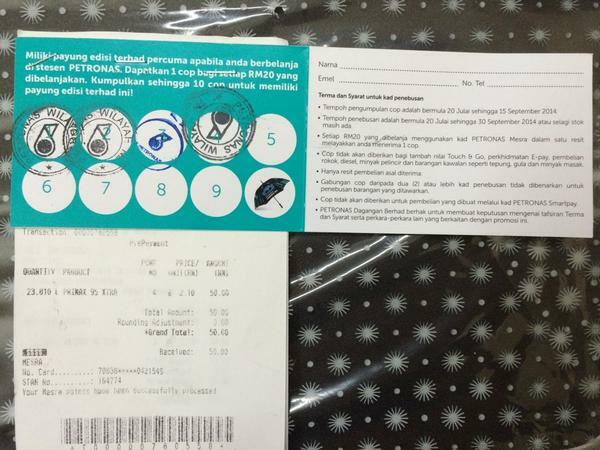 “Consumers have been tricked by Petronas… The promotional item does not exist,” he wrote on the page. Another customer, Lucas Xian Loong, said that Petronas should have put the umbrellas on sale instead. “Your umbrellas are as precious as gold. It’s better for you to put a price on them and sell them, if you’re so scared of losing money (by giving away) the umbrellas,” he said. “Great, Petronas!” he wrote, cynically. This entry was posted in Uncategorized and tagged ‘Gila-gila Payung’ (Crazy over umbrellas), ‘Gila-gila Remaja’, Faizal Hussein, Video: Memburu Payung Petronas: Petronas and the 'missing' umbrellas!. Bookmark the permalink. 5 Responses to Petronas and the ‘missing’ umbrellas! Yes, no stock! I went few Petronas. I have been waiting for this umbrella since early august. Same cliche answers: “x de stock”, “stock blm smpi”, “minggu dpn baru sampai” “baru saje habis”. Nampaknya kalau x mampu nak bagi x yah lah but campaign besar besaran. Awal2 lagi kita dah bli minyak dgn harapan nak dpt kan payung sekaki tu tapi hampeh sampai hari2 terakhir.